Hey all, sorry it's been awhile since I posted. Been busy and all which is a good thing. I couldn't wait to post this piece after I finished it. I've been wanting to do an illustration of Cloak and Dagger for awhile now, not because I know a lot about the characters, but because I really love their concept and design. Aspects of them are a bit dated (or a lot dated) but I dug the aesthetics. Enjoy! Everything you do looks like watercolor. I like this. 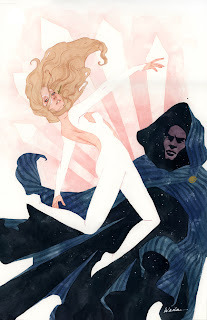 You captured the contrast between Cloak and Dagger beautifully. Cloak looks austere and sturdy while Dagger is serene and delicate. Stunning.